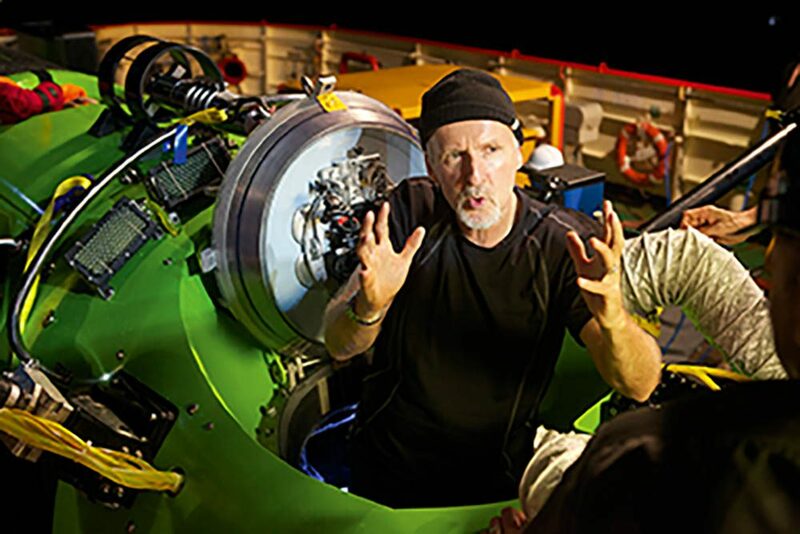 THE FILM DEEPSEA CHALLENGE 3D appeared on IMAX screens in 2014, two years after film-director James Cameron’s solo dive 6.8 miles down into the Pacific’s Mariana Trench, and I looked forward to this documentary going on general release in the UK. To that end I secured an interview with John Garvin, the British technical-diver, co-writer of the film’s screenplay (he also wrote Sanctum) and, as Life-Support Supervisor, a key part of the team that developed the Deepsea Challenger submersible. It was a very long interview. What I found particularly interesting was the scuba-divers’ approach to problem-solving employed by the team in building a craft that, just to give one example of the challenges, would shrink by 5cm under the intense pressure at its destination. “At least 60% of us were divers, and we approached the task with the same mentality as we would conventional dive expeditions,” said John. “This was a key to the success of the mission.” Particularly intriguing was the adapted rebreather technology employed. I wanted to time the divEr feature to tie in with the UK release date of the film but, frustratingly, this was put off again and again. The moment passed, and I binned the feature. a DVD when I wrote this review and then, guess what, the DVD release was itself postponed, so now it’s available as a video download instead! Yes, this is a film about serious dive-kit. It’s also very much about the emergence of Cameron as action man, set up through recreations of a childhood spent dangling pet mice in jam-jars in rivers, and constructing submarines out of cardboard boxes. Then he directed diver-favourite The Abyss, dived the Bismarck, and started measuring dive-depth in miles while making Titanic and Aliens of the Deep. He accumulated the dosh it takes to put film-directing on hold and be able to employ a team to build your own hi-tec submersible. Now he styles himself as an explorer who makes movies on the side. The film has a three-act structure. The first half-hour is all about Cameron’s motivation and transition from film-maker to undersea explorer. Act 2 sees the team faced by one problem after another – not only technical and weather challenges but the devastating deaths in a helicopter crash of Cameron’s close friends and noted divers, Andrew Wight and Mike deGruy. Act 3 covers the build-up dives, some of which went well and others not so well, climaxing in the big event of March 2012. Of course, the dramatic tension is somewhat diluted by knowing that Cameron makes it back safely to the surface (sorry, you knew that, right?). Also, the lunar landscape at journey’s end is rather anti-climactic visually. This isn’t about denizens of the deep – we do see some nice holothurians, sharks and octopuses on the build-up dives, but there’s zilch 6.8 miles down. Cameron’s repeated insistence that “it’s all about the science” we take with a pinch of salt, even if he did scoop up 68 new species at the bottom – all micro-organisms. We know it isn’t about the science but the technology, and a geeky boy’s dream coming true. It’s all about JC, but it is still an enjoyable film.